Running OSLO’s optimization has shown that having a single operand defined is probably not enough. During the optimization run the program computes the derivative matrix for the operands and solves the least squares normal equations. 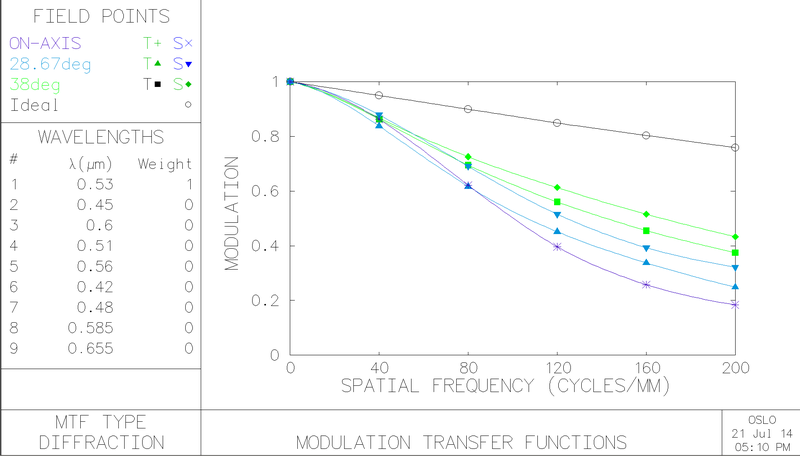 The iterations are repeated with various values of the damping factor in order to determine the optimal value of the damping factor. So, extra operands were added to split the initial error function – each new operand’s value is a contribution to the spot size (blurring) calculated for each color, aberration and certain image heights. See Fig.1 for formulas. 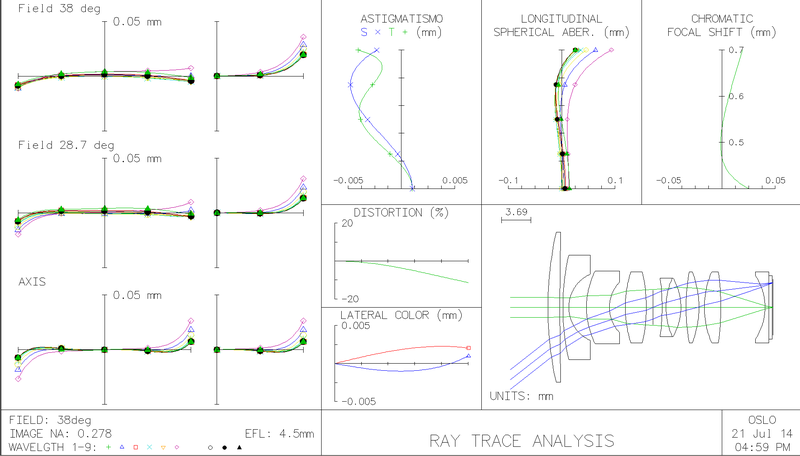 FieldCurvature(), LateralColor(), LongSpherical() and Coma() functions are defined in a ccl script found here – they use OSLO’s built in functions to get the data. 3 reference wavelengths, 7 image plane points (including center) and sagittal & tangential components make up 42 operands total affecting field curves shapes and astigmatism. To get the contribution to the spot size one need to multiply the value by Numerical Aperture (NA). NA is taken a constant over the full field. There are 3 bands the pixels are sensitive to – 510-560, 420-480 and 585-655 nm. The contribution to the spot size is then calculated for each band and 6 image plane points – there’s neither central nor tangential component – 18 operands total. The spot size contribution is calculated for the 3 reference wavelengths and 7 points at the aperture stop (including center). The tangential and sagittal components are equal, thus there are 42 operands. It doesn’t have a huge impact on the optimization but it was still added for some control. 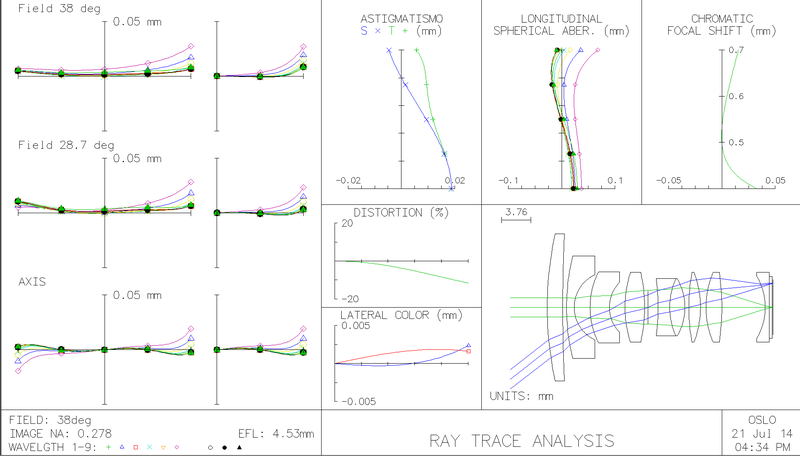 The operands are calculated for 3 wavelengths and 6 image plane points – adds up 18 extra operands. See Fig.2-5. All of the curvatures and thicknesses were set to variables, except for the field flattener and the sensor’s cover glass. The default OSLO’s optimization method was used – Dump Least Squared (DLS). Tried to vary the glasses but this didn’t lead to anything good – it tends to make the front surface extremely thin. This might be the best(?) what can be achieved with the current curvatures-thicknesses (and glasses) configuration. Spherical aberration seem to contribute the most at the current f/1.8. What would be the next step? It’s always possible to go down to f/2.0-f/2.5. But we would keep the aperture as wide as possible. Where? Make changes closer to the surfaces that affect spherical aberration the most? Make up extra achromatic doublet(s)? Where? Make changes to the surfaces that affect spherical aberration the most? One of the surfaces of the achromatic doublet? Where? Place a plano-aspheric element (flat front, aspheric back) at locations wheres rays are (almost) parallel? The thermal expansion might not affect the performance very much. Plano-aspheric element in the front of the lens? Aspheric surface on the achromatic doublet? As thin as possible? How thin can it be? Make the element after the doublet plano-aspheric? Are there glass-plastic (glass-polymer? hybrid?) aspheric achromatic doublets available? Is it possible to glue a thin plastic aspherics on a glass element (like a contact lens)?